Accusations, Rescue Operations and Drownings: What happens in the Med? – Interview with Ruben Neugebauer, spokesperson of Sea-Watch e.V. What exactly is Sea- Watch, how was it funded and who is behind it? Sea-Watch is a Search and Rescue organisation that is carrying out operations in the Central Mediterranean Coast, North of the Libyan coast. It is entirely founded through private donations as well as by the protestant church and some other foundations. But has no ties to politically institutions, or criminal networks, as stated in some allegations by the Italian prosecutor. Sea-Watch was funded by some private people around Harald Höppnera, civil organisations and volunteers. Volunteers from different backgrounds run more than 90 per cent of the work of Sea-Watch. Most of them are based in Germany but we are becoming increasingly European. Sea-Watch has launched a new common reconnaissance mission together with an organisation called Humanitarian Pilots Initiative. What are the objectives and what makes it necessary now? It is the first time an aircraft is used in a civil search and rescue mission at sea. It is always helpful to have multiple resources for rescue observations and if you need to look for a boat and cover a huge area. It is especially important in this time to increase observation capacity in order to be able to put pressure towards Frontex and other EU actors to send out more rescue ships. In the beginning the presence of search and rescue missions pushed Eunavfor Med and Frontex to send more boats, but slowly they retreated from the area. With the aircraft we can document and report distress cases to the Maritime Rescue and Coordination Centre in Rome so then they are obliged to act and to send assets. Easter weekend saw one of the biggest SAR missions in the last few years with over 8,000 people rescued in the Central Mediterranean. What exactly happened during the Easter Weekend? During the Easter Weekend we witnessed a new quality of non-assistance. 8500 people were rescued from the waters and initially only search and rescue fleets operated in the Central Mediterranean. On Friday, the first day with good weather, the civil fleet could handle the situation well. However, on Saturday, the first ship sent a Mayday* relay, as there were more people in distress than on the other days. Frontex ships and Eunavfor Med reacted by sending ships, but only one each, and only enough to cope with the situation that had already evolved. On Sunday, then we faced a situation in which there were not enough rescue assets by Frontex and Eunavfor Med and civil rescue ships (Moas Jugendrettet, Sea-eye) were in distress. That the arrivals would mount, was clear as there had been a good weather forecast for the upcoming period. What remains, then is the question: Why were the national and European forces not prepared for this situation? There are only two possible answers to this question, either they do not have access to the weather forecast, or they have a limited willingness to help. Meanwhile, the head of Frontex, Fabrice Leggerini has raised concerns over sea and rescue missions and their cooperation with security authorities. These allegations sparked wide criticism and Sea Watch has responded by inviting the Head of Frontex to a meeting in Berlin. What results would you hope from discussions with the European Border and Coast Guard Agency? All allegations are made up. We hope from a discussion with the European Border and Coast Guard agency that they would engage in public debate on this issue, because then this would become evident. We further would like to confront them with their apparent strategy of non-assistance, which lead to people dying, as has been horrifically shown during the Easter Weekend. Italian attorney Carmelo Zuccaro has also critizised SAR organisations what is your reaction? Yes, we are currently investigating which legal steps we can take. This person has overstepped the limits of his role as an objective representative of the legal authorities. His allegations are unfounded and his campaign against us is putting us in a bad light. This is shocking from a legal representative. The EU has been training Libyan Coast Guards from October last year in the framework of the Operation Sophia (Eunafor Med). The Council conclusions of February 2017 included closer cooperation with the Libyan Coast Guard. 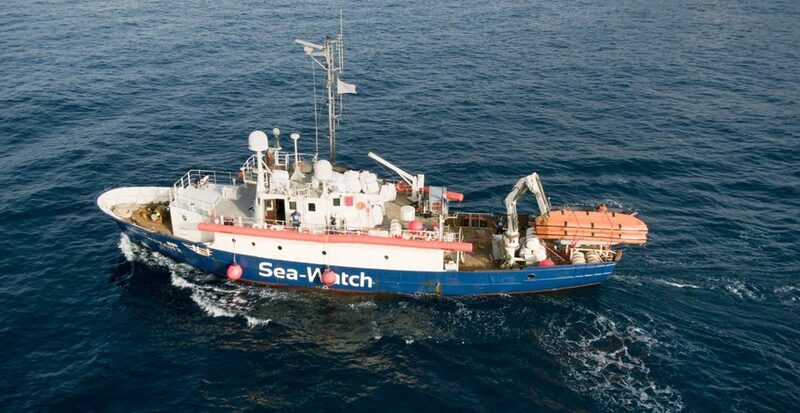 Sea-Watch itself has been reportedly attacked by the Libyan authorities before. How does cooperation between the Libyan coast guards and SAR mission look at sea? Firstly, there is not “one” Libyan Coast Guard, but different branches, which operate differently exist. In the last weeks we have received a lot of support from the Libyan Coast Guard of Zuwara. Before that we were attacked from a different branch. Different local militia operate in the area, so it the functioning of the Libyan Coast Guards also depends on which militia they are connected to. Some are even supposed to be linked to the smuggling business while others are doing, what seems to be an increasing strategic objective also from the European side: push-backs. We have in the past witnessed return by Libyan Coast Guards on the sea on our own, sometimes with deadly consequences. It is important to also say, that some of the Libyan coast guards are really trying to help.